Nejiri means twisted, as in twisted together, which translates as interlocked. Shapes or elements are stitched independently of each other, and as adjacent elements are worked, the thread of the current shape being stitched is passed under one side and over the opposite of the previously worked element. An alternate style is a one-stroke element that results in interlocking within that shape, such as nejiri mitsubane. In the example to the right, uwagake chidori kagari elements that are worked around the equator have been treated with nejiri style. The nejiri is highlighted in the red outline. Notice that the entire element interlocks with its opposite, rather than in the thread-by-thread, row-by-row manner of kousa style. It seems that the sequence of under-over rather than over-under to create the interlock results in a smoother outcome. Under-over maintains the thread and stitch on the same level. It can be worked either way, but avoiding over-under will maintain a smooth flow of the overall texture of the completed design. Begin by stitching the first element of the design - in this case the blue triangle. Anchor and begin working the second element. Using the eye end of the needle, pass the thread under the rows of the first element. When passing the needle under the first element, be sure not to catch any of the mari wrap threads. It can help to slide the needle back and forth under the threads to be sure that it moves freely without being caught. Pull the thread through, and take the stitch as needed. Carry the thread over the opposite side of the first element (which has established the under-over sequence), and continue to stitch the shape. Repeat for as many rounds as the design requires. All other stitching requirements are used depending on the stitch being executed, in addition to the under-over pass of the thread. 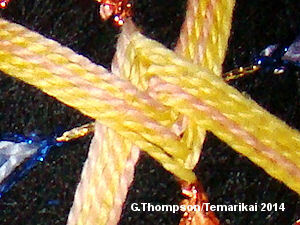 This first illustration show nejiri (interlocked); the second shows kousa (interwoven). The temari shows both styles in use in one design.